This article first appeared in Unlisted & Unlimited, The Edge Malaysia Weekly, on August 8 - 14, 2016. TAI Seng Yee is not your average businessman. Besides managing Southeast Asia’s largest organic fresh produce business, he is on a mission to help farmers regain their pride in harvesting the fruits of their labour and to restore their dignity as growers. Seng Yee has been doing this chiefly with Zenxin Agri-Organic Food Sdn Bhd, which his father started in 2002 to make organic produce mainstream, by helping contract farmers meet the stringent international requirements and sustainability standards to qualify for organic certification. The organic food market has grown exponentially in the last decade. Market research firm Organic Monitor estimates that the global market for organic products reached US$80 billion in 2014. A TechSci Research report, Global Organic Food Market Forecast and Opportunities 2020, says the global organic food market is projected to register a compound annual growth rate of more than 16% between 2015 and 2020. Seng Yee’s painstaking efforts stem from his belief that going organic is the way to heal the land, as chemically intensive and conventional farming methods have resulted in nearly irreversible damage to the environment and, to a certain extent, is the primary cause of food-related health problems. In an attempt to lead by example, he also teaches Zenxin’s contract farmers the importance of being certified as it shows that they are complying with the regulations and growing good food. As executive director of Zenxin, Seng Yee oversees its four farms, 21 contract farmers, a fertiliser factory, three packaging centres and 11 organic produce retail outlets throughout Malaysia and Singapore. The farms under its purview are certified by the National Association for Sustainable Agriculture Australia (NASAA), which is accredited by the International Federation of Organic Agriculture Movements (IFOAM). The contract farmers are required to adhere to NASAA standards. Their produce is then bought by Zenxin at a fixed price and quantity. “Farmers have to be able to read to know about the certification process, but a lot of them don’t even know how to read. So, we become their bridge and endeavour to get them certified. This is how we get them to change and they gain pride from the services they render to the community by growing good and sustainable crops,” says Seng Yee. Seng Yee says NASAA checks up on its farms annually while Zenxin inspects its contract farmers biannually. The certification does not come cheap and it is both onerous and time-consuming. So, his proposition is an attractive one for small-scale farmers. “It can cost more than RM10,000 a year and for small-time farmers, this is too much. But when you scale it, it is a different story as we can average out our cost,” he points out. Seng Yee has made sure that Zenxin is equipped with the facilities to test the authenticity of the organic produce if doubts are raised. “If someone doubts our vegetables, we will have them tested. We can do this because we record what we pack and where the vegetables are sourced from. The NASAA certification requires us to comply with labour rights and fair trade practices. So, although we buy the produce at a fixed price, we ensure that we pay them above market rate,” he says. “Our main criteria in choosing contract farmers is that they must be farming themselves. They cannot be wholesalers and we have to make sure their lives are better [after dealing with us] than they were before. “Initially, some of our contract farmers were growing 30 different crops, which was inefficient and impossible to sustain. That is why they tended to succumb to bad practices. Seng Yee’s efforts do not stop at making life better for farmers. He also ensures that his team is capable and has equitable representation. “We have a diverse team at Zenxin. The average age of our employees is 28. 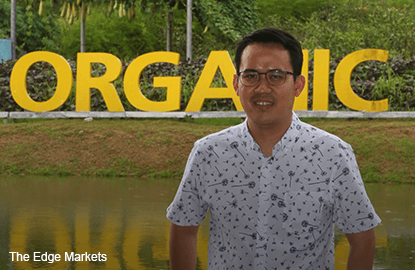 At our farms, we hire female managers — this is very rare in Malaysia — because we believe the organic movement is about respecting the traditions of the land, equitability and innovation,” he says. Seng Yee says the work he is doing with the farming community was not what he aspired to do when he graduated with a degree in computational finance from the National University of Singapore. “I thought I was just going to be helping my father out for about nine months and then find an office job somewhere. This was in 2006. But 10 years on, I am still here,” he jokes. Seng Yee does not openly express how much he has come to love what he is doing with Zenxin, but his understanding of the business and his zeal to make organic produce a mainstream staple come across very strongly. His exposure to agriculture started at a young age as he spent his school holidays working in the family farm, collecting eggs and cleaning chicken coops. His direct involvement with Zenxin began when his father, Tai Kok Kong, decided to dabble in organic vegetable farming after acquiring a taste for crops grown without the use of inorganic fertilisers. Kok Kong had been treated to a dish of synthetic-free cabbage grown by farmers in their backyard patch in Cameron Highlands, Pahang. Seng Yee says his father then stocked up his car with these leafy greens and presented them to his family, who agreed they were the best cabbages they ever had. The idea seemed to be a good one at the time as Kok Kong was in a dilemma over what to do with the organic fertilisers he had made from the manure collected at his poultry farms. He had been operating several poultry farms under the banner of Zenxin Agriculture since the early 1980s, when he was introduced to an innovative Japanese fermentation technology that turned chicken manure into a natural fertiliser. This not only provided plants with nutrients but also promoted healthy microbe growth within the soil. The company’s fertilisers are made by composting chicken manure, palm kernel cakes (from their oil palm plantations), coffee grounds and rice bran, which are then synthesised with the help of living microorganisms. On its own, chicken manure — or any animal faeces for that matter — is not considered organic as the farm animals are often fed genetically modified food to accelerate growth, among other reasons. “There wasn’t much awareness of the organic movement or the dangers of synthetic fertilisers and chemical-laced pesticides, so we couldn’t do much with what we had made,” says Seng Yee over a cup of organic mulberry tea grown on Zenxin’s farms. Having been an entrepreneur all his life, Kok Kong saw it as an opportunity to solve a problem. He invested in farmland in Gua Musang, Kelantan — some 700km away from the company’s headquarters in Kluang, Johor — and began growing vegetables. However, he had to shut down operations as there was no demand for organic vegetables, not to mention the logistical nightmare of transporting vegetables out of the remote location. “We started the farm in Gua Musang on the advice of some friends, whom we thought were experts in the field. They said to start an organic farm, it had to be located 50km from the nearest town so that it was relatively free from pollution; the slopes to grow the vegetables had to be steep; and the farmland had to be previously untouched. As it turned out, the advice was not at all true,” says Seng Yee. “We trusted them and spent a lot money on the 200 acres of land. I used to drive my father up the hilly terrain for more 10 hours during my semester breaks. All I can say is that it was a really bold investment. After working in this field, I can tell you that no one goes into organic farming straightaway like we did,” he says rather ruefully. They grew a lot of organic vegetables but couldn’t sell them because at the time, the market was not big enough. “We owned two shops in Kuala Lumpur but we had to close them because we were not familiar with the city. The problem persisted for many years as not many people knew about organic vegetables,” says Seng Yee. Organic produce commands very high prices but the main concern is the lack of transparency when it comes to farming practices. It was at this juncture that Kok Kong applied for permission to open an organic park on federal government land, under the Ministry of Agriculture and Agro-based Industry’s Modern Farming Project, to run awareness and educational programmes on organic produce. At Zenxin Organic Park, which tries to emulate the farm-to-table concept, visitors can be treated to delightful platters of steamed vegetables and ice dragon fruit slushies. In hindsight, although the Gua Musang venture ended up being a “RM30 million lesson”, he knew organic foods would eventually take off in Malaysia, says Seng Yee. “My father persevered. In the beginning, we lost about RM5 million a year, mainly due to all the wrong decisions. We could do this because we had other businesses to support this venture,” he adds. Besides its poultry and organic vegetable farms, the Tai family owns several thousand acres of oil palm plantations and ready-mix concrete plants, among others. Zenxin has made its presence felt in Malaysia and Singapore. The statistics back up its claim that consumers are increasingly making healthier choices as more retailers have set up specialised organic sections in their outlets. “Organic foods are becoming a staple in people’s diets. In California, it is about 25% while in Germany, it is about 20%. We supply to all the AEON stores nationwide. We supply to more than 50 supermarkets in Malaysia and more than 70 in Singapore. We are the leaders in both countries as well as in Southeast Asia,” says Seng Yee. Zenxin’s vegetables and other crops are packed within 24 hours of harvesting and sent to the retailers. Its retail outlets in Johor, Melaka, Kuala Lumpur and Selangor, as well as Singapore, not only carry its produce but also more than 200 organic products from countries such as the US, Peru, Egypt, India, Indonesia, Thailand, the Philippines and China. “We sell potato chips from Castillo, Spain. They are geographically specific because the olive oil they use to fry the chips is made from the olives that grow there, as do the potatoes. Come to think of it, we might look into applying for a geographic-specific certificate for the mulberry tea leaves we grow in Kluang,” he says. Zenxin mulberry tea compares favourably with green tea, but with a stronger grassy aftertaste and natural sweetness. In Singapore, Zenxin is among the few companies that market organic vegetables under its own brand. It is also popular for its delivery service. It also offers this service in Malaysia, but it is limited to areas near its retail outlets. “Organic vegetables taste different. Our price is the highest in the market, but our sales are the best. The market is very messy. There are farms that are certified organic, but they use vegetables from other farms when they sell their stock,” says Seng Yee. This is a business that requires great patience and the wherewithal to keep going despite multiple setbacks. “After 12 years, we finally broke even last year and made a profit. It was tough, but we finally turned the whole operation around,” he says.